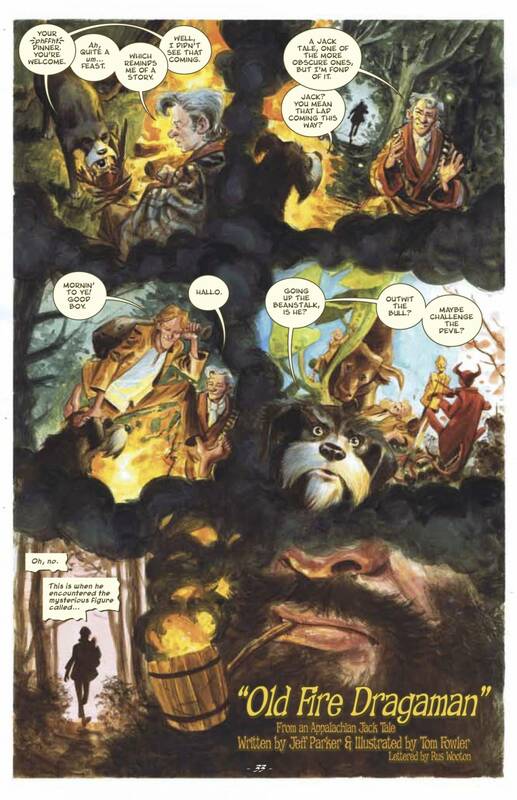 Jim Henson’s The Storyteller was a TV show, but somehow I missed seeing it: This graphic novel version serves as my first introduction. It’s such a wonderful graphic novel — and fitting for all ages — that I was curious to see if the TV show was supposed to be any good. Based on Amazon’s reviews, it was a much-loved show mixing live-action and puppets, as I’m sure some of you out there know. I was also curious to know before I wrote this review if fans of the TV show would be likely to enjoy this adaptation, so I took a quick glimpse at the reviews for this book on Amazon (I don’t usually like to read reviews of a book before I write on it): Based on my quick perusal, there was a positive response from those who loved the show and then read the graphic novel version. Basically, the response was along these lines: “I was apprehensive about reading this book since my expectations were naturally so high because of my love for the show; however, even with such high expectations, the graphic novel was an excellent read.” So, in addition to people like me who have never seen the show, previous fans will also like, perhaps love, Jim Henson’s The Storyteller. The four-part book is comprised of multiple stories, fables, and legends from Eastern and Western sources. The stories are told using a very-specific framing device: The old Storyteller — that legendary figure who moved from town to town carrying on the oral tradition — has settled down after a lifetime of adventure. In his home he is kept company solely by his talking dog to whom he tells the stories we overhear. Some of the stories are long and some are short, but in the space of this 135-page, four-part book, we get to “hear” nine stories: “Old Nick & The Peddler,” “The Milkmaid & Her Pail,” “An Agreement Between Friends,” “Old Fire Dragaman,” “Puss in Boots,” “The Frog Who Became an Emperor,” “The Crane Wife,” “Momotaro The Peach Boy,” and “The Witch Boy.” From what I can tell, the framing device is what ties this book to the show of the same name: All the stories are new to this volume and written for it. However, the final story, while also not seen in the original TV show, is based on a screenplay written previously for a never-produced episode. I read this book on Comixology, but it’s such a wonderful book and has such beautiful art that I wish I had purchased a copy for my real, instead of my virtual, bookshelves. I want my kids to read it; I want my friends to read it; and I want my students to read it. I want you to read it. If you like fables and tales at all, you’ll want this book. 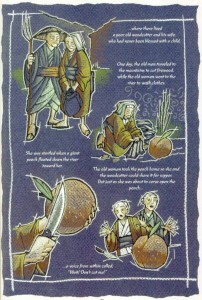 To me, the book is worth it for “Momotaro The Peach Boy” alone. This story is an old Japanese tale that I love. I have a Japanese version with the literal English translation added in under the Japanese, and as much as I like the phrase “cheeky monkey,” which is a repeated refrain, I feel that the literal translation could benefit from a more poetic refashioning. I am delighted that “Momotaro” has been rewritten perfectly for this volume by Ron Marz, the author who bravely rewrote the Witchblade title with a more feminist sensibility. The art, too, is perhaps my favorite in the book. In fact, it’s presented more as an illustrated story (texts accompanied by images that depict what is described in the text) and not as a comic (panels and words working together, mutually dependent). Picking a favorite story or a favorite style of art is difficult. Part of the enjoyment one finds in the book is the constant variation from style to style and story to story and culture to culture. Some stories are illustrated ones, and others are in a more traditional comic book style with panels and speech bubbles. But the content and the style of the art reflect both Eastern and Western sources, and it’s all the stronger for those differences. The connection is only one of oral storytelling translated into sequential art, perhaps two of the oldest art forms. To give a sense of the variety, I’ll write about the stories primarily in terms of their sources and artistic styles (instead of giving away the plots in case you are unfamiliar with any of these stories): “Old Nick and the Peddler” is from a Scandinavian folk tale and is very cartoonish with panels and speech bubbles; “The Milkmaid & Her Pail” is from an Aesop’s Fable and is slightly more realistic, with exaggerated colors, but still employing panels and speech bubbles. The Romanian tale, “An Agreement Between Friends,” perhaps my least favorite story in the volume, is unique in being told by the dog to the Storyteller. Perhaps it’s the art and the fact that there’s a floating dog’s head hovering in the left-hand corner of some of the panels that bothers me. However, his story explaining the reasons for the chain of tensions between the dog and cat and cat and mouse is funny. This third story ends the first part of the volume. The second part begins with an Appalachian Jack Tale written by Jeff Parker: “Old Fire Dragaman.” It has some of my favorite images, aided by the artist’s willingness to break out of the regular use of panels. For example, a page might have one or two panels layered on top of larger images that make up most of the page. The result is extremely interesting layouts and compositional designs, perhaps the most creative in the book. The second, and final, story in this part of the volume is the well-known French fairy tale “Puss in Boots,” which is told through the usual panels, but employs an unusually light palate of colors, particularly light blues and greys. The third section focuses on Asian legends: The first story is “The Frog Who Became An Emperor,” from a Chinese folk tale. It’s about a frog, the child of a Chinese couple (! ), standing up to father and emperor. It’s got some great art, because, well, who doesn’t want to see a talking frog who swallows and spits fire to defend his kingdom? “The Crane Wife” is a fairly well-known Japanese folktale. It’s told using very regular panels so as to not draw attention away from the depiction of this seemingly-innocent young couple who is eventually torn apart by betrayal and greed. 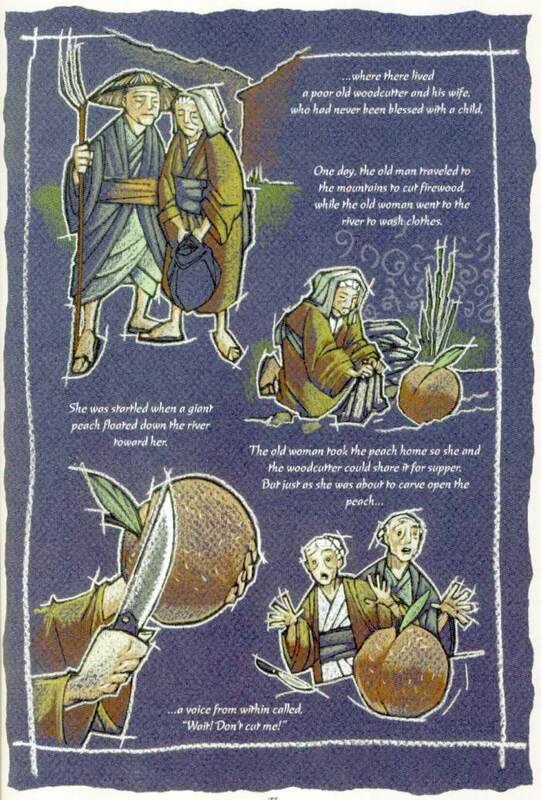 Part three ends with the short Japanese tale I already mentioned: “Momotaro the Peach Boy.” Each of its six pages presents illustrations backed by a page of one of six solid colors: first dark blue, followed by light purple, brown, light blue, light red, and finally light orange. This anthology of stories makes a great follow-up to my recommendation last week in The Fairy Tales of Oscar Wilde, Volume One. While I appreciate having a single artist adapting the tales of a single author like Wilde, I certainly like the variety in this collection: I’ve tried to emphasize in this review that the variety of tales, styles, authors, and artists make this an extremely interesting read. What makes Jim Henson’s The Storyteller deserve a five-star rating is that almost every story is told expertly and is compelling enough to make one want to both seek out the source material and read more fairy tales. When a book makes me want to read even more, I know it’s a good book. So check out Jim Henson’s The Storyteller. The only regret you’ll have is when you turn the final page and realize it’s over. Publisher: When people told themselves their past with stories, explained their present with stories, foretold the future with stories… the best place by the fire was kept for…The Storyteller! 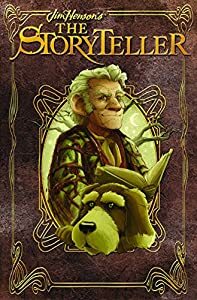 Archaia and The Jim Henson Company are proud to present all-new tales of fantastic wonder and extraordinary myth, as told from the tongue of The Storyteller and his loyal canine companion! Witness worded wonderment from a cavalcade of crafty creators, including Roger Langridge (The Muppet Show Comic), Marjorie Liu (Black Widow), Ron Marz (Green Lantern, Artifacts), Jeff Parker (Hulk, Thunderbolts), Jimmy Palmiotti & Justin Gray (Jonah Hex), Jim McCann (Return of the Dapper Men), Francesco Francavilla (Detective Comics), J.L. Meyer (Lady Pendragon), Tom Fowler (Green Arrow, Batman), Chris Eliopoulos (Pet Avengers), Colleen Coover (Spider-Man), Janet K. Lee (Emma), and many more!